NEW YORK – The 42nd Biennial Clergy-Laity Congress of the Greek Orthodox Archdiocese of America will convene in Philadelphia, Pennsylvania, July 6- 10, 2014, at the Philadelphia Marriott Downtown Hotel and it will focus on the theme of this Congress “The Orthodox Christian Family: A Dwelling of Christ and a Witness of His Gospel.” Concurrently with the Clergy-Laity Congress, the Greek Orthodox Ladies Philoptochos Society will convene its Biennial National Convention in the same venue. With the biblical affirmation ‘that every family in Heaven and on earth is named by God,’ (Eph. 3:15), we have recognized the vital connection of the family to God. This connection is essential to the true identity of the family, the life and well being of the family, and the role of the family both in the lives of its members and in the world. We must affirm the priority of ministry to the family. We must focus our efforts on connecting families to God. Certainly, this is essential for the salvation and well-being of each member, but it is also vital to our work in sharing the Gospel. May we focus specifically on our calling to strengthen families. May we commit the time and resources in the months and years ahead to nurturing Orthodox Christian families that are a dwelling of Christ and a witness of the Gospel. The Clergy-Laity Congress is convened biennially and is concerned with all matters, other than doctrinal or canonical, affecting the life, growth and unity of the Church, her institutions, her finances, her administration, educational and philanthropic concerns and her growing role in the religious life of the nation. 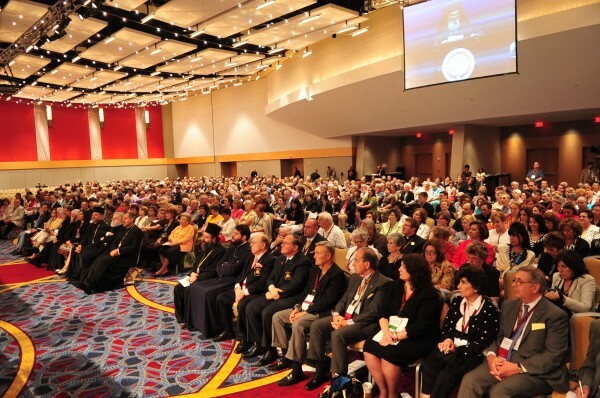 The 42nd Congress takes place this year in the Metropolis of New Jersey headed by His Eminence Metropolitan Evangelos, and is co-chaired by Anastasia Michals, of Manasquan, NJ (home parish: St. George, Ocean, NJ) and Michael Karloutsos of Philadelphia, Pa. (home parish: St. Luke, Broomall, Pa.) Metropolitans Stephanos of Kallioupolis and Madytos and Athenagoras of Belgium will be the Patriarchal representatives. In addition to the 2014 National Ladies Philoptochos Society biennial convention, other organizations are holding meetings and include the Archdiocesan Presbyters Council, the National Sisterhood of Presvyteres, the Retired Greek Orthodox Clergy of America, the Order of Saint Andrew – Archons of the Ecumenical Patriarchate, and the National Forum of Greek Orthodox Church Musicians.